It was wet and windy for our visit to the Southampton Boat Show but we didn't mind: it wouldn't have been good weather for working in the boatyard. And, we spent a lot of time book-signing. The interest in our story from people of all ages and walks of life surprised us. Topsail - our insurance brokers - organised a 'do' and we gave a short talk for Ocean Cruising Club members - as well as meeting up with friends from afar. On the second day Kelvin Hughes ran out of books - so we were able to escape to do some shopping, ticking off some of the items we need for re-fitting. In the last 3 weeks we've been really lucky with the weather and making the most of it. 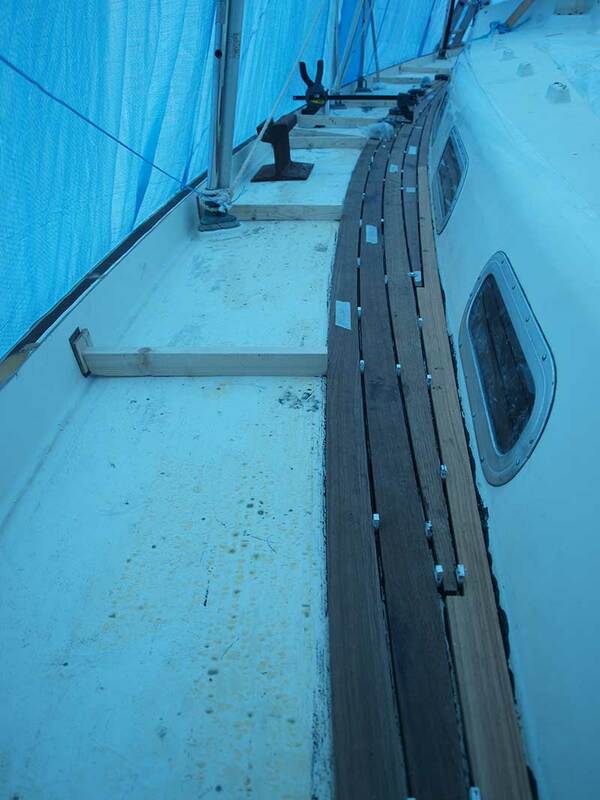 We still had a lot of work to do preparing the underlying deck and cutting the new planks. We finally started laying them down at the end of September and have been making slow but steady progress ever since. The port side is 80% complete and we're now working on the starboard side. Our only outing has been a memorable night at the Cruising Association HQ in Limehouse where we gave a talk to a packed house of cruising friends. The next major book event will be in Newcastle on 23rd October: an RNLI fund-raising evening being organised by Storrar Marine.